In at number 5 is the man that many believe was able to break the Maradona/Pele stranglehold on the best player of all time title. And part of that can be attributed to his performance in big games. Although an attacking midfielder, he wasn’t in the Maradona, Platini and Lampard gang of prolific scorers. In an 18 year professional career, he got double figures on just six occasions, with his highest season total being 12. However, as you probably know, he stepped up on the biggest stages. The most recent player to score in two World Cup Finals, Zizou scored a headed double in 1998 and then a pretty much perfect penalty in the 2006 Final against Buffon, which also had added pressure as he’d announced it would be his last game as a professional. What a great way to bow out…. A perfect volley into the top corner from a looping cross on his weaker foot? Not a problem. That goal also won the trophy for the Madrid. And whilst that was his most notable goal in a great club career, he also scored plenty of other significant goals. Many forget the semi final goal against bitter rivals Barcelona at the Nou Camp (seen here), whilst his time at Juventus was also memorable, if a touch unlucky as he lost two finals with the Turin giants. In the 1997 Champions League Semi Final, Zidane scored against Ajax, before scoring against Monaco at the same stage a year later, before going on to lose the finals to Dortmund and Real Madrid respectively. In fact, his Champions League campaigns involving Juventus generally didn’t end too well, with his former club knocking out Real Madrid at the same stage in 2003, despite Zidane’s goal in a 4-3 aggregate loss. He was of course much much more than about goals, but the fact that he stepped up with so many high pressure big game goals, only added to the high regard he was held in. There’s a great article that makes a pretty good case for comparing Rivaldo to Zidane, and rightly so, however, doesn’t quite match Zidane’s achievements and ability to impact the very biggest games so consistently – surely something that warrants the Frenchman’s placing in the history of football. 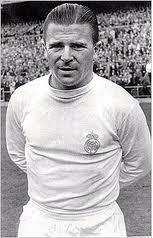 Yet another one of the dominant Real Madrid team of the 50s and 60s, Ferenc Puskas holds the distinction of scoring two hat tricks in the finals of the European Cup, in fact one of them was actually a four goal haul. 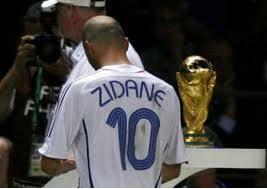 He also had the distinction of playing for different countries at the World Cup – firstly Hungary and later on Spain. But more on that later. A dominant part of three great teams, Puskas first came to prominence playing for the Hungarian military team Honved where he earned the nickname “the Galloping Major”, whilst playing alongside fellow Hungarian legends Czibor and Kocsis. He won five titles in his time with them and the golden boot in four seasons – including a 50 goal season in 1947-48, which was the highest in Europe. But it wasn’t with Honved that Puskas became known and feared around Europe, it was with his national team – the Mighty Magyars. He would eventually go on to score a massive 84 goals in 85 appearances for his (first country) and in that time they beat England 6-3 at Wembley and 7-1 away (unheard of then) as well as going on a 32 game unbeaten run that saw them win the 1952 Olympics (with Puskas scoring in the Final) that ended at the worst possible time – the 1954 World Cup Final. In the Final, Puskas showed his big game temperament once again as he put the favourites 1-0 up after just six minutes. That lead became 2-0 before West Germany managed to turn the game around and win 3-2 in a match that came to be known as the Miracle of Bern. After leaving Hungary in 1956 on a tour around Europe, Puskas was one of many who refused to return to Hungary. As a result he received a 2 year ban from FIFA. Once the ban had ended, he was turend down by clubs in Italy and was denied a move to Manchester United before Real Madrid took a gamble on the overweight 31 year old. And it didn’t end too badly for him. In his first season, he scored two goals in the European Cup semi final against neighbours Atletico as Real went on to retain the trophy. The following year he really made his mark. In a semi final against rivals Barcelona, Puskas scored three goals over the two legs to put Real in their fifth straight Final – and it was in this Final that his legendary status at Madrid would be cemented. Facing Eintracht Frankfurt, Puskas scored four goals in a 7-3 win:. And of course, he wasn’t done there. After a year off, Madrid were back in the final in 1962, and juts to prove it wasn’t a fluke before, Puskas scored another hat trick in the final – although unfortunately for him, he was facing a Eusebio inspired Benfica who scored five to his three. Not to worry though, him and Real Madrid won the trophy again in 1966 with the big 39 year old striker scoring four goals in one game against Feyenoord along the way. So a World Cup Final goal, an Olympic Final goal, and two European Cup Final hat tricks. That pretty much settles any debate (if there was any). He went on to manage several teams, most notably taking Panathinaikos to the European Cup Final in 1971 (the only time a Greek club has ever reached that stage) and in 2002, the Hungarian national team stadium was renamed in his honour. Where to start with Pele? How about some modest words from the man himself: “Every kid around the world who plays soccer wants to be Pele”. Well he is the only man to have won three World Cups, but personally, I wanted to be Tony Cottee. Even still, he is generally considered to be one of the holy trilogy of the greatest of all time. 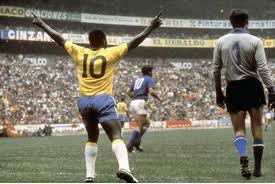 Scorer of over 1,000 goals, Pele will be judged by some due to never playing in European leagues – though this wasn’t necessarrily his fault, like Eusebio, Pele was banned from leaving Brazil – certainly in his prime anyway. As you’d expect, 3 World Cups + Brazil’s all time top scorer (77) = some big game goals. 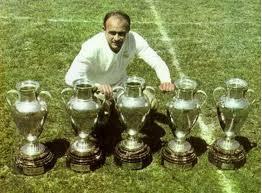 He also did pretty well for his club team Santos as well. Although not quite as prolifc as Alberto Spencer, Pele did end Penarol’s dominance in the tournament as Santos became just the second team to win the tournament in 1962. With the two legged final ending level on aggregate, Santos had the returning Pele for the Play Off, and he didn’t disappoint with two goals in a 3-0 win for the Brazilians. A year later he was even more deadly, scoring a four goals in the two legged semi against Jairzinho’s Botafogo (including a hat trick in the away leg), before scoring again in the second leg of the final against Argentina’s Boca Juniors to claim his and Santos’ second title. In what was a good tournament for Pele, he also won the golden boot in the 1965 season. Much of what was said for Puskas can be repeated for his strike partner Di Stefano – apart from serving for the Hungarian Army that is. It’s more the games scored in then, and the fact that like Puskas, Di Stefano wasn’t particularly bothered about his nationality – also appearing for Spain as well as his native of Argentina, and also for one time home, Colombia. He also qualified for Italy. Di Stefano spent 11 seasons with Real Madrid after playing for River Plate of Argentina and Millonarios of Colombia, despite not signing until he was 27. But it could have been very different – Di Stefano was destined for Madrid’s great rivals Barcelona until complications allowed Real to nip in at the last minute to at first share him with the Catalan club before eventually owning him outright. At one point there was a scenario where he’d play alternate seasons for each club – it’s hard to imagine that’d work out too well today. And Barcelona’s loss was certainly Real Madrid’s gain as the capital club went on to win the first five European Cups in a row, and whilst Puskas’ input was instrumental, no one had a bigger hand in the era of dominance than Di Stefano. Of the five European Cup wins from 1956 to 1960, Di Stefano scored in every single Final – including a hat trick in the 7-3 win over Eintracht Frankfurt. And it wasn’t just the Finals that he excelled in. Starting with inaugural tournament in 1955-56, where there were just 16 teams competing, Di Stefano scored in the semi final win over AC Milan (5-4 agg) before going on to score Madrid’s first goal in the final against Stade Reims as they won 4-3 against Hibernian’s conquerors. A year later he repeated thhe trick with a semi final strike against Matt Busby’s youngsters before going on to score the first goal in the Final win against Fiorentina. And his knack of scoring important goals would continue into the next season. After a hat trick against Hungarian’s Vasas in the semi final, Di Stefano scored Madrid’s first goal for the third conscutive Final – this time an equaliser against AC Milan, in a 3-2 win. The 1959 Final saw him score against Stade Reims who would no doubt be sick of the sight of him, this time in a 2-0 after he scored both home and away in the semi final win against city rivals Atletico Madrid. And the fifth and final consecutive European Cup win was arguably the best, with a famous 7-3 win over Eintracht Frankfurt. Di Stefano once again scored Madrid’s opener and in fact their second as well, on the way to a hat trick in a match considered by many to be one of the greatest of all time. Perhaps just as importantly, he scored a brace in the semi final win over Barcelona. In what was a recurring pattern, not only would he score important goals, but he’d also step up in the games against rivals – with Barcelona and Atletico Madrid on the end of his goals. So there you have it, the Alberto Spencer of the European Cup and undobtedly a big game player. The only disappointment was that he only did it in one competition. Everyone else in the Top 10 scored in multiple competitions, with most impacting the World Cup. Unfortunately for Di Stefano, Argentina refused to participate at the 1954 tournament, Spain failed to qualify in 1958 and he was injured for the 1962 edition – meaning Di Stefano would join a list of greats never to play on the biggest stage with the likes of George Best, George Weah, Ryan Giggs and Julian Dicks. And it wasn’t just his playing career that was eventful, moving into management, he memorably led both Boca Juniors and River Plate to national league titles, whilst in Spain he won the League, the cup and European Cup Winners Cup with Valencia. However, he couldn’t quite replicate that success with his beloved Real – finishing second in the league, the Copa del Rey, the Cup Winners Cup, Supercopa de Espana and the Copa de la Liga – five runners up medals! Eusebio described the Blonde Arrow as “the most complete footballer in the history of the game”. Not a bad way to be described if you’re a footballer. And at number one is a player that scored 68 goals in 62 Internationals for his country, and who scored in the Final and Semi Finals of the three biggest tournaments possible. 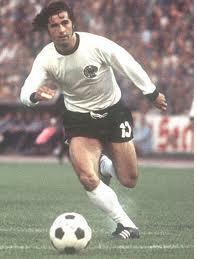 Gerd Muller, known as ‘Der Bomber’ was a prolific striker for every team he played for and in every competition. In total, he scored 655 goals in just 709 games – and these don’t include the types of goals that Romario counted, these were real goals. He was top scorer in the European Cup, The World Cup, the European Championships, the Bundesliga, and probably in training too, yet he’s never seriously considered when talking about the second tier of greats – after Pele, Maradona and Zidane, people tend to discuss Cruyff, Best, Charlton, Di Stefano and plenty of others, but never Muller (certainly not in England anyway). Yet he was the most reliable and devastating player of his generation. He won the Bundesliga four times, the German Cup four times and the European Cup three times (in a row), among other trophies. You could point out that he was playing for Bayern Munich but when he joined them (in 1964), they were still in the second division having won a single title in the 1930s. It’s fair to say that he played a massive part in the history of Germany’s super club. So on to the goals, the first of his big game strikes was in 1970 World Cup. Aged 25, Muller scored a double in “The Game of the Century” – not a bad way to introduce yourself to a global audience. Unfortunately for Gerd, it was in a 4-3 defeat to Italy. He scored two goals in extra time which in any normal circumstances should have been enough to win a game, not in that game though, as Italy scored three. He did at least finish the tournament as the Top Scorer with 10 goals, including the winner in an epic quarter final against 1966 conquerors, England. Regarded as a better team than the 1966 champions, Muller capped off a comeback from 2-0 down to put West Germany through. He wasn’t to be denied though, and four years later, on home soil he would have his moment of glory. Although he didn’t quite get the golden boot, he did score the winning goal in the final against Johan Cruyff’s much fancied Holland, and in scoring his 14th World Cup goal, he became the top scorer in World Cup history – a record that stood for 32 years until Ronaldo took the crown (it took him an extra World Cup).That made it an impressive double as Muller also top scored as West Germany won Euro ’72, including two goals in the Final against Russia. Before that he’d scored a double against Belgium to put his country through. A year later, he and they faced Don Revie’s Leeds team led by Billy Bremner in France. Despite only finishing the German league in 10th positon, Muller and his team mates managed to shake off their poor domestic form to win 2-0 – Muller scoring the second. It was a game remembered for some unusual refereeing decisions, but Muller didn’t care as he and his team mates won their second successive European Cup. And a year later, they were celebrating again – this time beating Saint Etienne. This time Muller didn’t score in the final, instead saving his impact for the semi finals against Real Madrid – scoring once away and twice at home as Bayern knocked out the one time dominant force in the competition. He was also known mistakenly as “Short Fat Muller” after a hilarious lost in translation moment, but what was never in doubt was his ability to influence the biggest games in football. Pressure was not an issue for him. He was quite simply the most prolific big game scorer that’s ever played football. Comments posted on 30th January have been imported from the old site. The list is favouring European based players players though. South American teams have an advantage of 22-21 wins over Europeans in the Intercontinental Cup, which was not included here. Copa Libertadores began in 1960, which gives European players a further advantage of 4 years since the European Cup started in 1956. Copa Suramericana is not counted, but UEFA Cup, and Cup WInners Cup are. Semi-finals of Big tournaments are included, but those are not the only big games. Many league games are title deciders, and some Big tournament Group Stage games are also very important. Pele for example, has 26 goals in his 15 career finals. World Cup – 1958 – Sweden 2 x 5 Brazil . Two goals by Pele. Brazil won their first ever world cup. World Cup – 1970 – Brazil 4 x 1 Italy. 1 goal and 2 assists by Pele. Brazil won their third World Cup. Libertadores – 1962 – Santos 3 x 0 Peñarol . 2 goals by Pele. Santos won the Libertadores for the first time. Copa America 1959 – Argentina 1 x 1 Brazil. 1 goal by Pele. Brazil lost the cup held in Argentina to the hosts by total points overall, although they were unbeaten! 1961 – Santos 5 x 1 Bahia . 3 goals by Pele. Santos won their first brazilian championship. 1962 – Botafogo 0 x 5 Santos. 2 goals by Pele. At the Maracanã, Santos beat the legendary Garrincha, Didi, Zagallo, Nilton Santos, Amarildo team to win their second straight Brazilian championship. 1962 – Santos 3 x 2 Benfica. 2 goals by Pele. First leg of Intercontinental Cup. 1962 – Benfica 2 x 5 Santos. 3 goals and 1 assist by Pele. Santos are World Champions. 1963 – Santos 2 x 0 Bahia. 2 goals by Pele. Santos won their third straight Brazilian championship. 1963 – AC Milan 4 x 2 Santos . 2 goals by Pele. 1st leg of Intercontinental Cup in San Siro. 1964 – First Leg. Santos 4 x 1 Flamengo. Pelé scored 3 goals. Second leg: Flamengo 0 x 0 Santos. This is the only major tournament decisive game Pele didn’t score. Santos won their fourth straight Brazilian championship. 1965 – Vasco 0 x 1 Santos. 1 goal by Pele. Video of first and second leg goals: Santos won their fifth straight brazilian championship. 1966 – Santos 2 x 3 Cruzeiro. 1 goal by Pele. Santos lost to the legendary Tostão team after winning 5 straight brazilian championships. 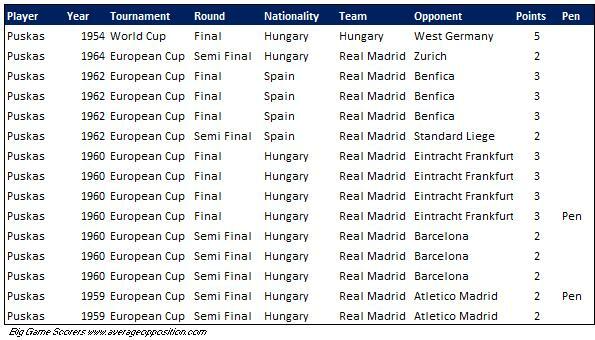 Pele total record in career finals : 26 goals in 15 matches! 1.73 goals per game average! You have not included some goals like Pelé´s goals in Copa America of 1959. He was top scorer with 8 goals in 6 matches in single-round Group stage Tournament with no Knockouts! Hi ST, thanks for the comments. The 22-21 split of Intercontinental Cup wins would suggest that I’m not favouring either region here. It’s also my opinion that European Clubs don’t take this competition any where near as seriously as their South American counterparts – as an example, Ajax (1971 and 1973), Bayern Munich (1974 and 1975), Liverpool (1977 and 1978) and Nottingham Forest (1979) all pulled out of the tournament, despite being European Champions. With regards to the Copa Libertadores starting 4 years after the European Cup, they also have two legged finals, and on regular occasions, had a third round as a play off. If anything, there’s been far far more Finals in this competition which gives the South American based players a big advantage. On the Copa Sudamerica, I’ll hold my hand up and admit that as the UEFA/Europa League competitions were included, so too should this. However, looking at the final scorers of recent times, it would have little impact on the Top 50 list as it’s only been going since 2002. As for Pele, he’s in at number 3. I didn’t include the 1959 Tournament as it was a one off, and it wasn’t the Copa America. And with the cup final goals and league deciding games, then it’s the same as above – I can’t include those games in the Brazilian league in the 1960′s and not Top Flight games from every league in the history of football (or at least since the war). I appreciate your input, but it’s just not do-able, and you do show a slight bias to Pele!! If South Americans had an advantage because of the two legged final, I think it is fair to reduce the weight of each leg to half of European Cup Final. I think the weight difference of World Cup Final and European Cup Final of just 1 point is little. Euro Final has double the points of a semi, Final 4 pts, semi: only 2 pts. It is a bit conflicting. How can the FInal of a WC be just 1 point more important than the Euro, and at the same time the Semi twice as importnant as the respective Euro semi?! 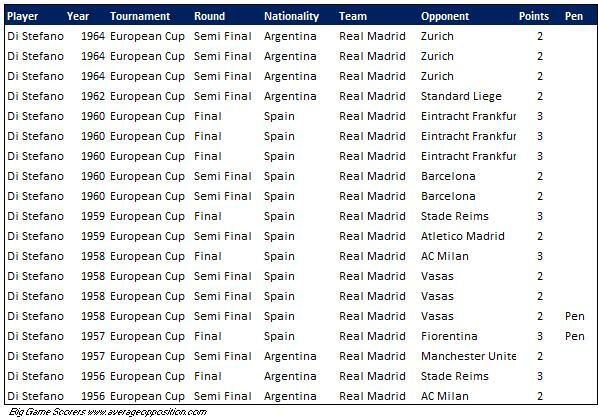 About the Intercontinental Cup: The European teams cought up in the last years, in the 90s and 00s. The difference was a lot in favor of SA in the past. More matches means a bigger sample gives a better idea. Actually Pele is stil ln a disadvantage, since Santos voluntarily withdrew from Copa Libertadores on FOUR occasions in the laste 60s. As for Copa America 1959(called then South American Championship), the one Pele played in(there were two that year) was the most important one, held in March and the one were Brazil sent its full squad, with Nilton Santos, Didi, Zagallo and other World Cup winners. In the second one held in Ecuador Brazil sent a B squad containing only Pernabuco based players. Hi ST, I think the fact that there were two held in the same year would suggest that it was the right decision not to include it. UEFA Cup/Cup Winners Cup/ Copa Sudamericana/…: 0.4 pts for Final, 0.2 for two legged final. (I say 0.4 and not the more obvious 0.5 since I would not consider a player winning both UEFA Cup and Cup Winners Cup as important as winning the European Cup, therefore the combined points of those two still add up to 0.8, less than the 1 pt of the EC. Ronaldo is one example of winning Uefa and CWC in 1997 and 1998, but still does not equal a CL win in my opinion. All methods have flaws, and the competitions have not always had the same status. Today most World stars play in Europe, before the 90s and 80s it was not like that. about Copa America 1959. Both were considered official, but the one in Ecuador was called “Extra”. Still one can include both and cut their points by half. Naturally they will follow the logic of the rest of the weightings. That is 0.25 pts for each leg, adding up to 0.5 pts total, half the ones of the respective Finals. I have rated the World Cup with 4-5 pts, a lot higher than the Euro´s 2 pts. 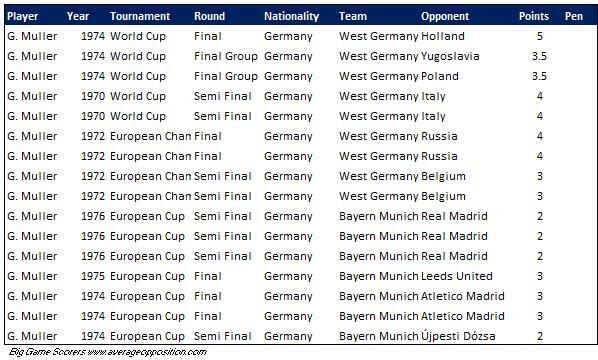 Since South America has roughly half the World titles, even with Europe hosting more World Cups, it makes sense to say that European teams have twice the chances to win a Euro tournament compared to the World Cup. I found the difference of Euro 4 – World Cup 5 too little considering also that Europe has hosted the WC 10 times and South America only 6. In wins it is 10-9 for Europe. I found that your rating of 3.5 for all games of the Final Group stage, and not considering the opponent, was too much compared to the Final giving an unfair advantage to some players. 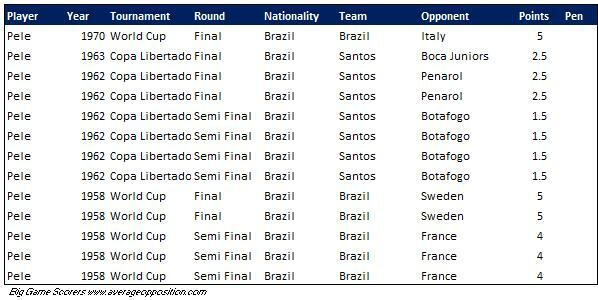 why Pele's goals in world club cup finals, copa libertadores finals and semi finals, copa america tournament goals are not included and equivalent of this tournaments of Muller and Stefano's are included? !